In Chile, the nonprofit organization Fundación Educacional Oportunidad is partnering with the Ministry of Education, Harvard University, and 60 very under-resourced majority rural schools to improve the language skills of economically disadvantaged preschoolers. Its work builds on over a decade of using improvement science to tackle some of Chile’s most vexing social problems. While the work is just under two years old, it’s noteworthy for blending insights from scholarship, quality improvement, and on-the-ground expertise in support of children’s learning. Based on research, Fundación understood that for young children to achieve necessary levels of language and literacy development, schools had to maximize instructional time, improve student attendance, and promote effective early literacy instruction. A multidisciplinary team of coaches and experts on improvement and early education worked with 15 districts, 118 school leaders, and 148 teachers and teachers’ aides and determined that these primary drivers for improving language development resonated with practitioners in the field. Of the participating schools, 60% are located in rural areas. BY ENGAGING PARENTS, TEACHERS, AND SCHOOL LEADERS TO BECOME ACTIVE AGENTS FOR IMPROVING IN THEIR OWN CONTEXT, FUNDACIÓN EDUCACIONAL OPORTUNIDAD IS SHOWING RESULTS AND MAKING PROGRESS ALONG EACH OF THE CORE PROGRAMS. Together, the team identified a set of drivers aimed at having 80% of children in pre-kindergarten and 90% of children in kindergarten reach the advanced category on a Spanish language evaluation by the end of 2017. The schools then worked with Fundación to implement strategies that included providing teachers with help on time management in the classroom and integrated lesson planning, to maximize instructional time; coaching and video feedback to promote effective literacy instruction; and attendance committees to provide one-on-one support for improving student attendance. 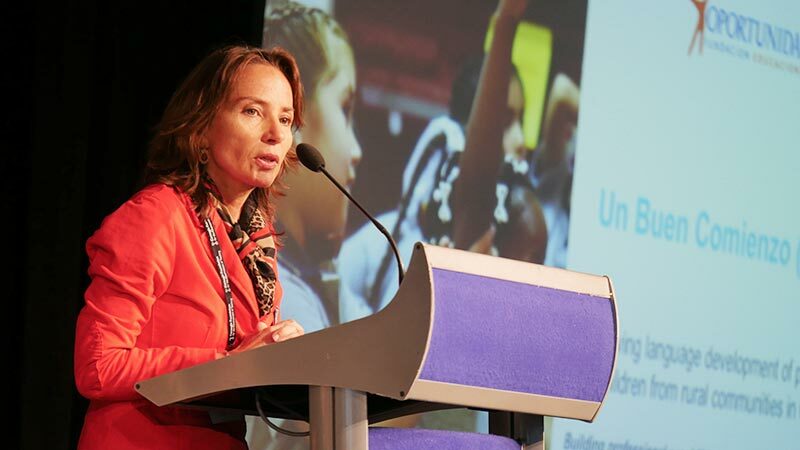 VIDEO: A presentation by Un Buen Comienzo Improvement Network, Fundación Educacional Oportunidad at the Spotlight on Quality in Continuous Improvement Symposium on November 15, 2018 in Washington, DC. Fundación also brought together parents, school leaders, teachers, teachers’ aides, and local education agencies three times a year to teach them how to use quality improvement tools, such as identifying the root causes of problems and using plan-do-study- act cycles to test whether their approaches to improvement were helping schools make progress in the target areas. During these meetings, the members of the networked improvement community also shared what was working and identified new challenges to be collectively addressed. Fundación also supported teams of teachers and school leaders in visiting each other’s schools to observe innovations and share data. At the classroom level, teachers proposed innovations and used rapid iterative cycles of experimentation to test whether the innovations were producing improvements and then adjust accordingly. By engaging parents, teachers, and school leaders to become active agents for improving in their own context, Fundación Educacional Oportunidad is showing results and making progress along each of the core programs. Children’s language scores are improving—although they have not yet reached the 2017 targets. And the schools have seen progress in the amount of time spent on instruction. This work demonstrates that the science of improvement can be used and adapted to spur positive change in the most under-resourced and isolated settings and can be applied internationally.